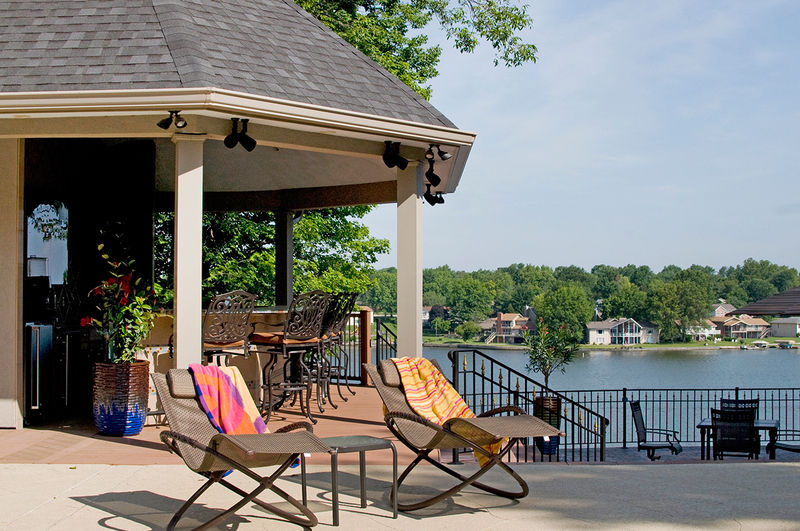 With dramatic landscaping and unexpected finishes, two Lake Saint Louis homeowners give lakeside recreation a whole new look. The first step, then, was demolition; once the original structure was cleared, interior designer Ellen Kurtz of Ellen Kurtz Interiors helped the Malashocks craft a chic and comfortable resort-inspired cabana with high ceilings and an array of plush, modern finishes: oversized fans, an intricate LED and solar lighting scheme by Extreme Electrical, poolside misters, a wireless sound system — even faux palm trees from a supplier in Wichita, KS. There’s a taste of the tropics inside, too, where small aqua pebbles give the bath and changing rooms an elegant yet relaxed feel. “We wanted something that was functional as more than just a bathroom,” Malashock says. Hence the pool house’s lower level, working as an offseason storage unit. 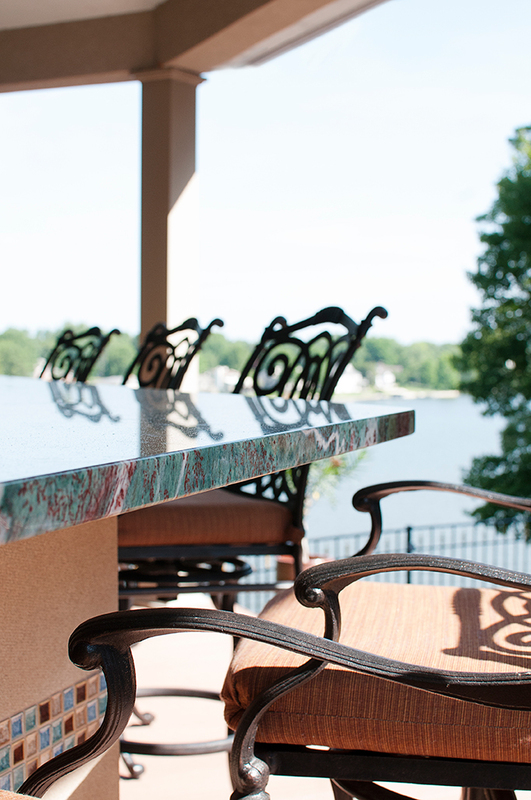 And, of course, there’s the bar, too, which comes fully equipped with a kegerator, ice maker, refrigerator and grill — all positioned behind a sprawling lake-blue granite countertop the homeowners stumbled upon at Bedrock International. “They love the color blue,” says Kurtz who, based on the countertop selection, picked Oceanside Glasstile from ICS Surfaces for the bar’s backsplash and incorporated blue and rust hues into a mosaic the Malashocks’ handy sons installed. Up above, a showstopping polyurethane-coated piece purchased at an art show in Marco Island competes with Cardinals games on the flat screen — both off which add welcome pops of red to the color scheme. After resurfacing the existing pool, the Malashocks built a waterside deck they’d later top with heavy Amini’s wrought-iron furniture capable of withstanding lakeside gusts. And, it’s these layers the homeowners cultivated that really enhance the resort-inspired ambiance. 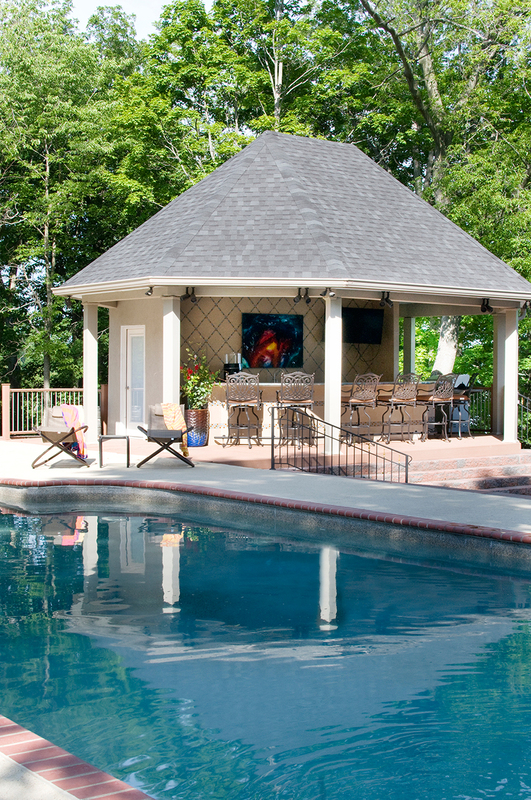 “You go from house to pool to a deck with a bar then down to another deck with seating by the lake — not many people have so many different tiers,” Kurtz says. 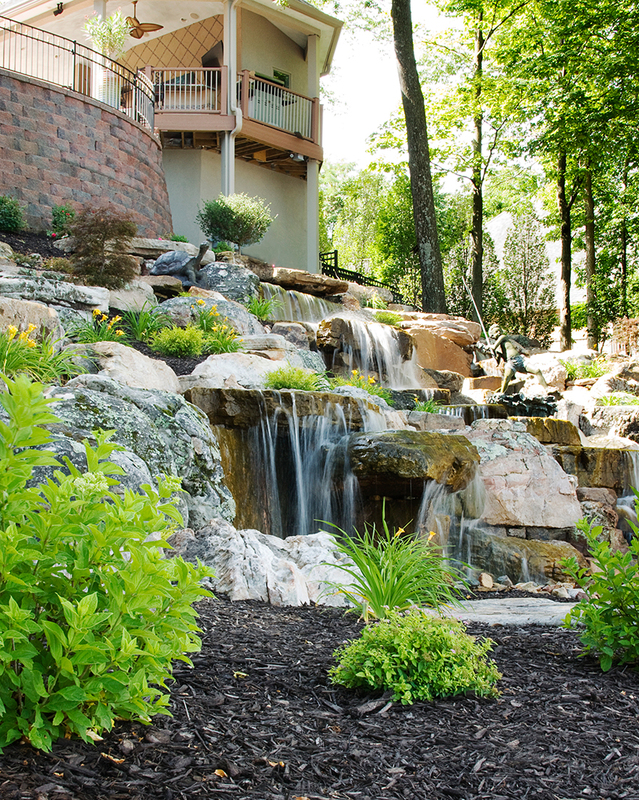 Another novelty is expertly plotted landscaping between the top and bottom tiers — and, that wasn’t so easy to achieve. “The previous owners had over-landscaped, and you felt like you were walking through a tunnel to get outside,” says Malashock. Beyond that, the rest of the area was gravel and weeds. “We had the most horrible looking yard on the lake,” says the homeowner. Over five months, Malashock – with the help of Nature’s Re-Creations – transformed his vacant hill into an inspired waterfall and boulder-infused slope that draws the good kind of attention. The task required a structural engineer, a 250-gallon underground reservoir and two massive retaining walls. After digging boulders into the hillside, Malashock integrated plants that were “more about beauty than about being indigenous,” he explains. Day lilies and roses, then, were bright choices — ones visitors see up-close when hopping patios by way of path or on the unexpected built-in tram.